Want to hear a joke about pizza? Never mind, it’s way too cheesy! OK, now that I’ve told you my new favorite kid joke, I can tell you about this week’s free printable of the week. It’s my favorite kind of teaching tool: It’s pretty self-explanatory and it’s versatile! 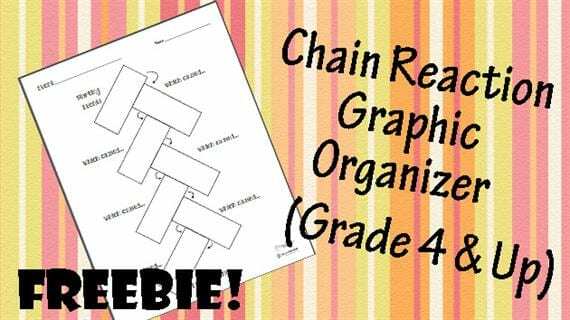 This graphic organizer is geared toward upper-grade students (fourth grade and up) because it is more text-based than picture-based and relies on the student’s understanding of cause and effect. 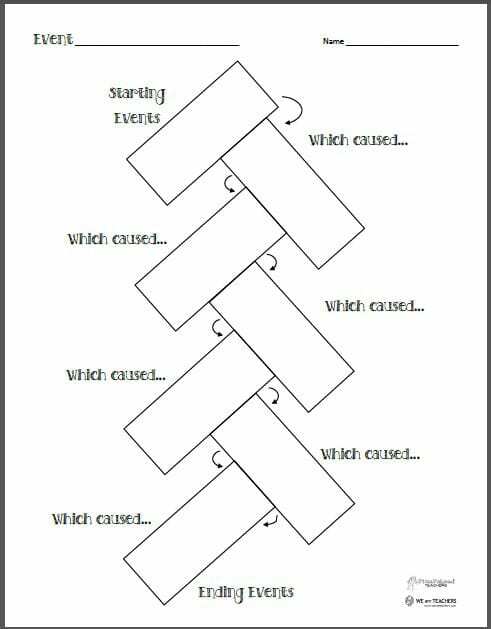 This page works well to describe a chain of events in a science experiment or major event(s) in history. Students could diagram the plot of a story on this graphic organizer. The options for implementation are pretty broad. You might come up with uses for it that I haven’t included here! Squarehead Teachers has taught a variety of grades ranging from kindergarten to higher education in the United States and abroad. She enjoys scuba diving, bright colors and cookies. She likes to share teaching ideas and free teacher materials on her blog, Squarehead Teachers. This will work great for the book Because of Winn Dixie.